Superlight Performance: Constructed with Pure Carbon Fiber you don’t have to worry about the weight(680g)! It can reduces paddler fatigue. Adjustable Size: Our 3-piece paddle is adjustable from 72 to 86 inches, making it ideal for anyone to use! It only takes seconds to setup and take apart. 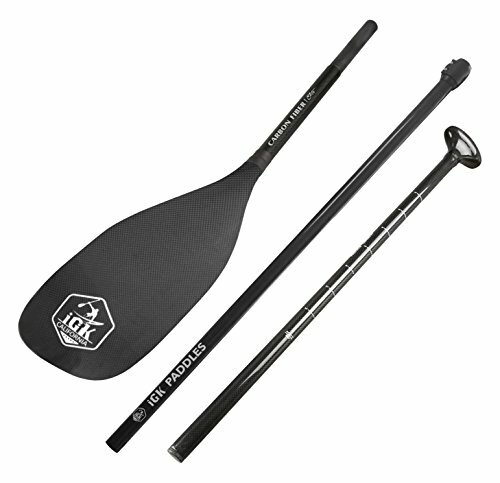 Super dihedral blade: Double concave and dihedral blade adds stroke stability making paddle perfect for high performance paddleboarders. It also floats! YOU WILL BE ABLE TO REACH THE PLACE YOU NEVER THOUGHT! GO TO DISCOVER NEW ROUTES WITH iGK PADDLES! You will be the fastest when you have a boat race with your friends! You can teach your child to learn to paddle when you and your family rowing in a river! SUP is a fun sport for the whole family, including pets and you will have fun with iGK SUP paddle! Features: High strength; Lightweight; Fashionable and beautiful appearance. Rugged 3-room paddle bag: The 3-compartment paddle bag make travelling incredibly easy and prevents paddle from becoming too hot to handle. Choose iGK paddle: iGK paddle is the best choice for those who take their paddle pretty seriously. If you have any problems just contact us, we will resolve any issues for you! Carbon Fiber & Glass Fiber 10¡ã+95 sq.in., Carbon Fiber & Glass Fiber 11¡ã+87 sq.in., Carbon Fiber & Glass Fiber 6¡ã+105 sq.in., Pure Carbon Fiber 10¡ã+80 sq.in., Pure Carbon Fiber 12¡ã+96 sq.in., Pure Carbon Fiber 8¡ã+104 sq.in., Pure Carbon Fiber 8¡ã+95 sq.in.